"It's too hot to even drink alcohol"
Don Kushner emerged from his afternoon hike on Camelback Mountain clearly a little run down from the heat. Kushner was one of the few who ignored warnings to avoid strenuous outdoor activity and decided to exercise outside on one of the hottest days in Phoenix's recorded history. "Here it's your own private mountain and it's wonderful," he said, covered in sweat Tuesday. Phoenix authorities issued several warnings about the dangers of the heat. Phoenix park ranger Chris Webb said she saw about a dozen hikers on Camelback Mountain in the afternoon hours. President Donald Trump signed a new executive order on Tuesday that will bring back jobs to areas hit hard by clean power regulations. Environmental advocates in Massachusetts say the move will reverse years of progress against climate change. "I would recommend that people do something less strenuous than to come out to the toughest hike in Phoenix in the middle part of the day," she said. "Maybe go swimming. Maybe do something indoors instead." The first day of summer brought some of the worst heat the southwestern U.S. region has seen in years. Arizona Public Service Company, the state's largest electricity provider, says customers set a record peak usage Tuesday as temperatures in Phoenix soared to nearly 120 degrees. Over 7,300 megawatts of energy were consumed between 5 and 6 p.m., topping the prior 11-year record set in 2006. Meteorologists said Tuesday's temperature in Phoenix topped out at 119 degrees, a mark that's only been matched or surpassed four other times in the city's recorded history. The all-time high was 122 degrees on June 26, 1990. Death Valley, California, reached 127 Tuesday and Palm Springs hit 122, tying the degree for the same day last year. 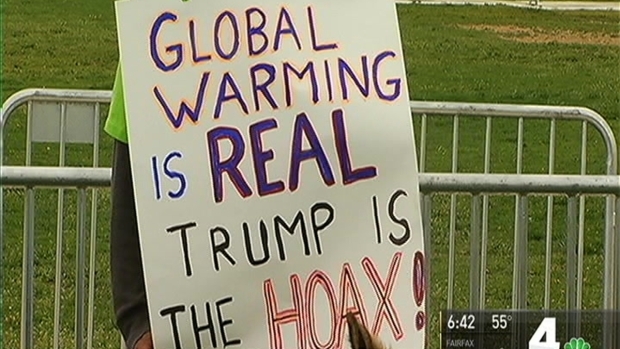 Demonstrators braved the rain Saturday to participate in the March for Science in D.C., and called on President Trump to support policies that protect the environment. News4's Derrick Ward reports. The heat wave comes amid new research findings that nearly 1 in 3 people now experience 20 days a year when the heat reaches deadly levels. The study of nearly 2,000 deadly heat waves worldwide since 1980 was published Monday in the journal Nature Climate Change. Workers at a construction site in a Phoenix suburb huddled under the shade of an excavator during a break. At another building site, men in hard hats and yellow vests labored and sweated in the heat, downing water to stay hydrated. Las Vegas also baked. Visitors tried to stay inside air-conditioned casinos, and some tourists lugged packs of bottled water around the Strip. Others went to a bar where the temperature is set at 23 degrees (-5 Celsius) and glasses, walls and seats are sculpted from ice. Tonya and Lavonda Williams traveled from Orlando, Florida, to Sin City to see the Backstreet Boys in concert. Walking on the Strip in 112 degrees was too much to handle, even for people accustomed to heat. "This is like the oven door is open," Lavonda Williams said as the sisters walked from a pedestrian bridge into The Palazzo casino-resort. "It's too hot to even drink alcohol," Tonya Williams added. In Phoenix, hundreds flocked to Grace Lutheran Church for water and refuge. "We have homeless people come from a long way to sit here," longtime volunteer Moses Elder said. "There are other spots where you can go get cold water and sit down and cool off, but there are few places you can lay down and get something to eat." In the Southwest U.S., this week's heat has caused a handful of problems. In addition to grounding more than 40 flights of smaller planes, airlines have been taking other measures on larger jets to reduce their weight. American Airlines spokesman Ross Feinstein said the carrier began limiting sales on some flights to prevent the planes from exceeding maximum weight for safe takeoff in the hot conditions. About 50 people went a PetSmart store in a Phoenix suburb Tuesday to receive free elastic booties to put on their pets' paws so they don't burn on concrete and pavement.